1) Put the garlic, macadamia nuts, breadcrumbs, oil, vinegar, salt and water in a blender. Blend until you get a smooth liquid with a bit of body. 2) Brochette: dissolve the tempura flour in the iced water. Dip the dried fruits in it and then fry them in plenty of hot oil. Allow to cool a little then make up the brochettes by alternating the two fruits on wooden skewers. 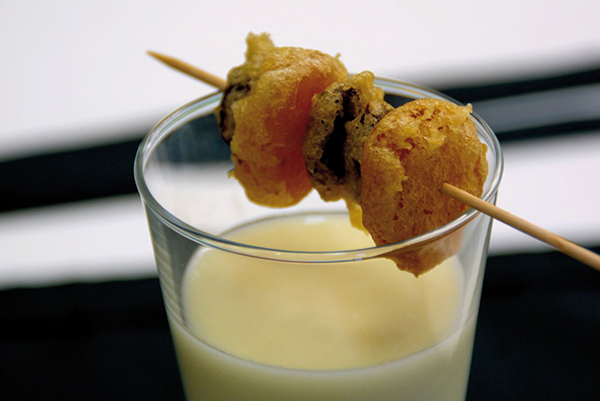 3) Serve the soup in glasses topped with the brochette.